Contractor Website Design Hampton Roads | Another exceptional website contractor design by VISIONEFX. Looking for a site redesign to properly brand your contractor business? The creative process for determining your online brand begins with sharing, brainstorming and discussing your vision. Next step are concepts to develop a starting point form where we branch out to develop the multiple concepts of your website design. This is the starting point where we use different elements found in a successful website. These elements include color variations, layout, font typography, navigational, and call-to-action areas. 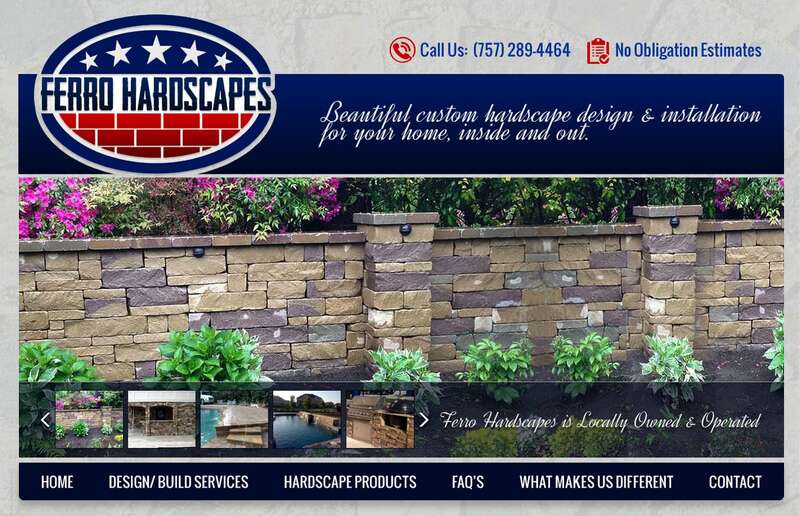 This recent web design Norfolk project for Ferro Hardscapes provides a competitive branded website presence in a highly competitive space. See our ‘View Our Design Process‘ link below and browse all the creative concepts we develop before building you that perfect website design that is tailored to your business brand. Or maybe get inspiration for your own brand or marketing project. Call VISONEFX at (757) 619-6456 or email direct to info@visionefx.net. VISIONEFX has great Google Reviews from verified customers posted on ‘Google My Business pages’. We invite you to read our reviews and contact our website customers. They will tell you our web design and web maintenance services are second to none. Search ‘Contractor Website Design Hampton Roads’ and find the website design experts at VISIONEFX.